The award, named for famed osprey advocate Meeri Zetterstrom of Milton, was presented to the awardees for more than 25 years of work and education to improve the Lewis Creek watershed, which spans Ferrisburgh, Monkton, Charlotte, Hinesburg, Starksboro and Bristol in Addison and Chittenden counties. Nominated by employees of the state Department of Environmental Conservation, Illick, the executive director, and LCA were praised for using data as a tool to support conservation in the watershed. Like Meeri Zetterstrom, who was never afraid of ruffling feathers as she worked to restore nearly extinct ospreys to Vermont’s skies, Illick and the LCA have embraced the difficult conversations that often accompany environmental progress. “LCA has pushed the envelope of water quality protection and preservation with municipalities and the DEC,” Pease and Bates said. Illick and the LCA were unanimous winners in a selection process that involved a panel of GMP employees with responsibilities related to land management, resource protection, community relations and education, and environmental compliance. GMP Vice President Steve Costello, who worked closely on osprey education and conservation with Zetterstrom for years before she died in 2010, said Zettersom would applaud Illick and the LCA. “Meeri had an unbending commitment to Vermont and the environment at large, and knew that water quality was critically important,” Costello said. “Given that they only eat fish, her beloved ospreys rely on clean water every day, so she would celebrate Marty and the LCA’s work. 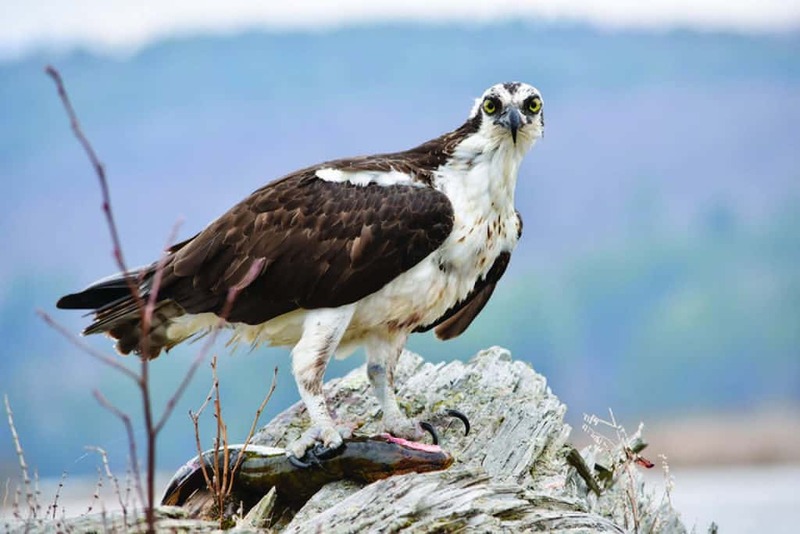 Zetterstrom began what became a statewide initiative to restore endangered ospreys in Vermont in the late 1980s. After years of effort, the birds were removed from the endangered species list in 2005. Plans for the GMP-Zetterstrom Environmental Award were announced in 2010, shortly before Zetterstrom died, with three goals: recognizing similar environmental heroes, honoring Zetterstrom’s legacy, and inspiring others. A female osprey enjoys a late-day meal of northern pike at Lake Arrowhead in Milton, where osprey advocate Meeri Zetterstrom started an effort that eventually lead to their recovery from virtual extinction in Vermont.